It’s that time of year again, where getting your landscape ready to sit for the next 4 months is imperative. There is a laundry list of what needs to get done before the snow hits. Have you heard of tree pruning? It is where you remove dead and low hanging branches off your trees. Landscape trees need more attention than trees that grow out in the woods. Make sure you know how to do this before you do it incorrectly, one wrong move can shorten the lifespan of a tree. It is important that you know what type of tree you are dealing with. You do not want to accidentally prune a tree the wrong way as this could potentially stunt its growth and stop new branches from growing. Cleaning: When you take off all of the dying, dead, diseased, weak, and low bearing branches. Thinning: This is when you selectively take off branches to improve the structure and enhance light to shine through to stronger branches. Raising: The removal of low branches to clear room for buildings, vehicles, and pedestrian. Reduction: To reduce the height and overall size of the tree. It is inevitable that there will be snowstorms to hit our neighborhoods this winter, and how you choose to prepare is up to you. If you want your lawn and the well-being of your trees to be in good shape, consider pruning them. The removal of dead tree branches is best for new ones to grow. Snow being added to a tree throughout the winter is not ideal and is even worse when the branch is dead. Also, dead tree branches are more likely to fall off during the winter with weight added to them. This can be hazardous to people if the trees are located where pedestrians are or even if you park your car under trees. If you have trees in your front yard or driveway be sure to scope out the bad branches and remove them. Not only does pruning your trees promote healthy growth, but it also beautifies your yard. If curb appeal is important to you, then this is definitely a step that you should be taking. In the spring when it is time to get your yard ready after the freeze, your landscape will look great. All of the dead and decaying branches will have already been taken care of, and new ones will be able to grow. Maintaining your trees will, in the long run, make for an easier life going forward. 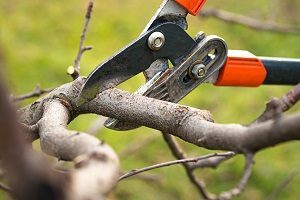 Be sure to take the correct measures when pruning your trees. Follow the different ways to prune above. Pruning your trees for the winter should happen before the snow hits. Contact Greener Horizon today to clean up your branches. We provide full estate management services, from top-level landscape design and master planning, down to the details of plant health care. Trust that you are in the right hands, and allow us to get the job done.